Plato DVD Ripper is a powerful all-in-one DVD Ripper software. Plato DVD Ripper helps to copy DVD Movies to AVI, DivX, XviD, MPEG1, MPEG2, Apple iPod, Apple iPhone, Youtube FLV file, Sony PSP MP4, WMV, Microsoft Zune, Cellphone 3GP video , BlackBerry Video, Pocket PC video, RM video ... and Extract Music from DVD Movie to MP3 /AAC/M4A/AC3/WAV/WMA file.It has two dvd rippers mode: Direct read mode. and DVD Player mode. * DVD Player mode. In this mode, with playing and converting method , you could read all dvd movies with all kinds of protections including with sony arccos protection. ?It is faster and more compatible than direct read mode. Plato DVD Ripper is a powerful all-in-one DVD Ripper software. 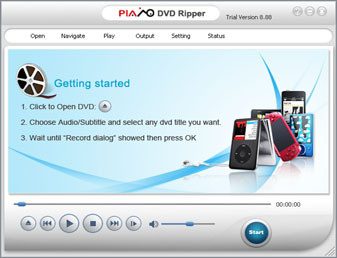 Plato DVD Ripper helps to copy DVD Movies to AVI, DivX, XviD, MPEG1, MPEG2, Apple iPod, Apple iPhone, Youtube FLV file, Sony PSP MP4, WMV, Microsoft Zune, Cellphone 3GP video , BlackBerry Video, Pocket PC video, RM video ... and Extract Music from DVD Movie to MP3 /AAC/M4A/AC3/WAV/WMA file.It has two dvd rippers mode: Direct read mode. * Simple and friendly UI design. With player mode, it support any dvd movies with all kinds of protections. Qweas is providing links to Plato DVD Ripper 11.11.04 as a courtesy, and makes no representations regarding Plato DVD Ripper or any other applications or any information related thereto. Any questions, complaints or claims regarding this application Plato DVD Ripper 11.11.04 must be directed to the appropriate software vendor. You may click the publisher link of Plato DVD Ripper on the top of this page to get more details about the vendor.